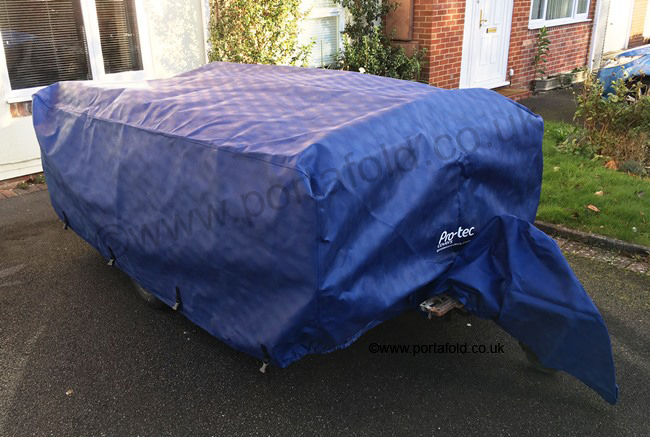 Following some extensive research of the suppliers of breathable caravan covers I have found what I believe to be the best cover (for the best price) to fit your Portafold or Ansfold. They are made to my exact measurements by market-leaders Pro-Tec. The covers are made with Protex 003 which protects against UV rays, rain, rust, snow, sun, dust, dirt, tree sap, bird droppings etc. As Protex 003 is breathable the cover will also protect from mould, mildew and condensation as the cover will allow naturally occuring moisture to evaporate. The fabric will keep out up to one metre of standing water, which even in the UK is far more than you’ll ever need, and is also guaranteed for 3 years. Coloured top layer - UV stabilised which helps to reflect direct sunlight preventing the bleaching effect of the sun. Central Membrane - Provides a waterproof protection whilst retaining its breathable properties, allowing naturally occuring water vapour to escape. Lower Layer - A soft non-abrasive inner lining ensuring no scratching or marking to your windows or bodywork. The cover will come complete with its own breathable storage bag, a tow hitch cover, webbing straps that pass underneath and clip together either side with quick release buckles. These are supplied separately so that during fitting they do not trip you up or scratch the van. 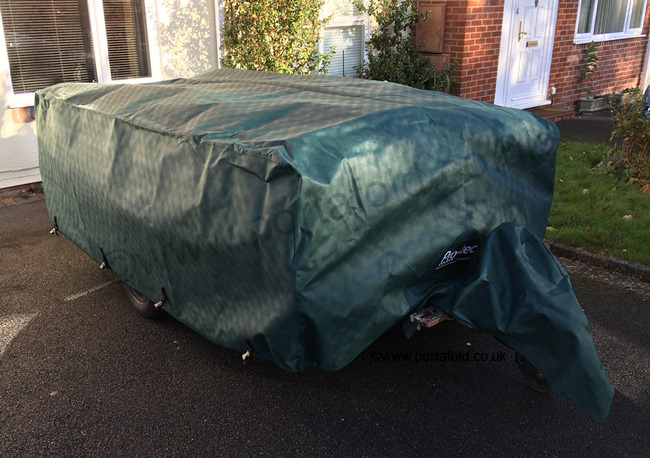 The cover can also be applied whilst the caravan is wet as the naturally breathable properties of the cover will allow any moisture to escape naturally. The fabric comes in a choice of three colours, green, grey or blue. 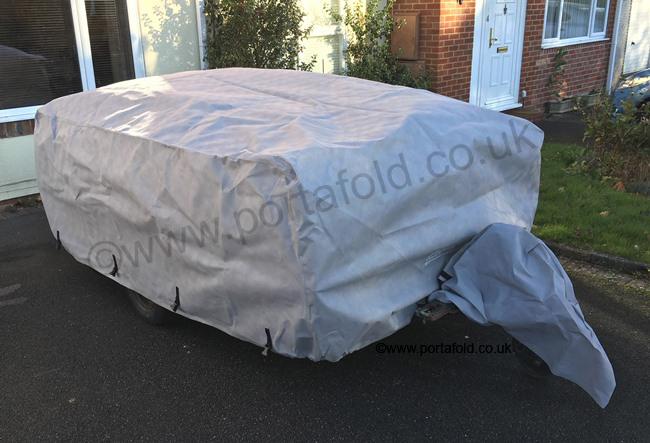 To save any confusion: This cover is specifically designed for the Portafold and Ansfold caravans, and is priced as such. It is also designed to be used with the caravan folded down, not erected. Using it whilst the caravan is unfolded will be fully at the owners risk. Volkwagen Camper & Commercial - "In our opinion this is the best around. I have had one of these covers for two years now and can personally vouch for its quality and durability, and satisfied customers include Martin Clunes." Motorcaravan Motorhome Monthly - "The period my van has spent under the Pro-Tec cover has had the result of greatly reducing the time and effort washing, cleaning and polishing. As I live on the North Sea coast, my van is now also shielded from salt bearing sea breezes." Pro-Tec covers were also chosen and featured by the Discovery Channel's Caravan Show. Bailey Caravans have tested and accepted along with other leading caravan manufacturers that Pro-Tec covers are not detrimental to their caravans.